OMG, Spring is coming soon, but I am still catching up with summer photos! Well, actually suits for the spring style. At Firle Vintage Fair in August. I took a photo of them last year too. Here. I love this fair, everything is vintage style. 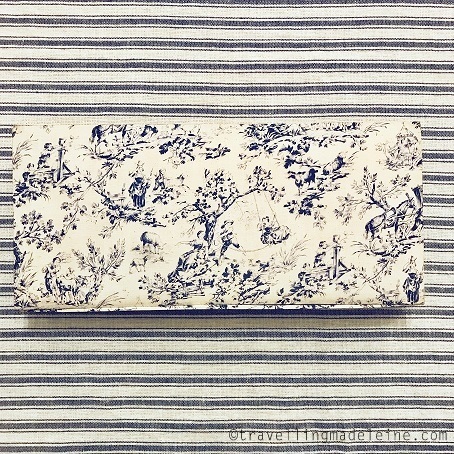 We, customers should wear vintage style too. like their vintage summer picnic style. I would love to go there this year again! Here are my favourites of the new items of January! I wish I could show them earlier.... but it's difficult for me as I update collection by themes. The first collection of this month is jewellery like Champagne, as we celebrated the new year! Gold and small stones like Champagne bubbles. My favourite is this 1930's twisted necklace and 1950's Miriam Haskell's earrings. Miriam Haskell is American brand, so it is hard to find with reasonable price for buying. I love decorative Haskell design, but I think these earrings are more useful for dairy use. 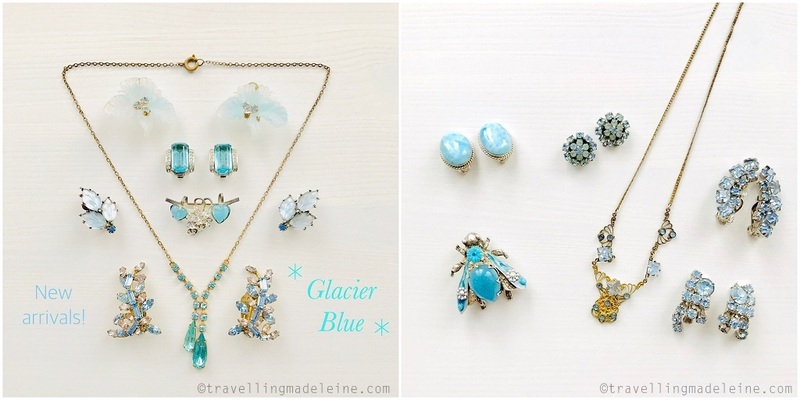 2nd collection is Glacier Blue jewellery. It is my favourite colour. It is perfect for this season. 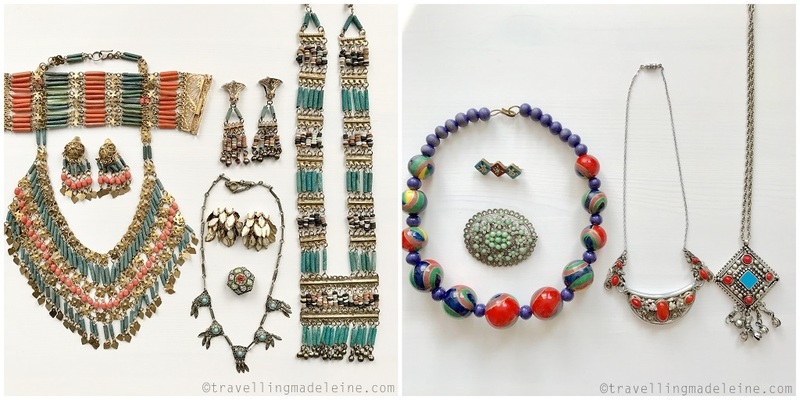 The jewellery in the right photo are not going to be appeared in our online store, but in the market. If you are interested in something, please email me. The 3rd collection is Lucky Charms for the new year. How about them for your lucky charm for 2019? Golden monkey from Charles Horner is not really lucky charms, but it is very collectible. It could be your original lucky charm!! The 4th collection will be tribal jewellery. But Boho style is definitely in fashion every season, so get them now. The jewellery in the right won't be in online store. They will appear in the market in February. These are for markets as well. 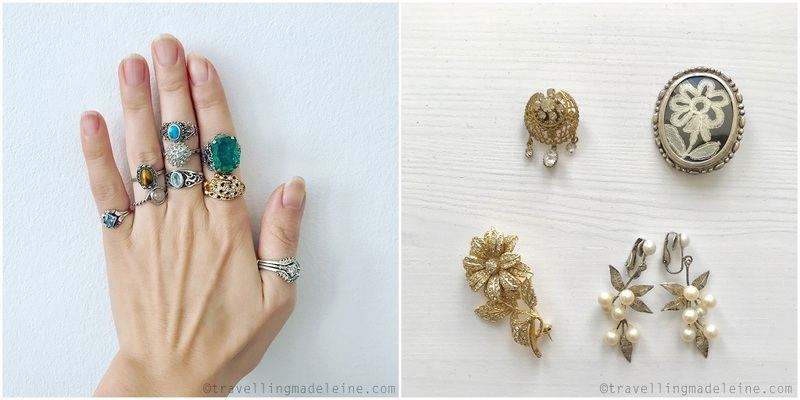 I love vintage rings and these are new rings for this month. I have got some new homeware items. 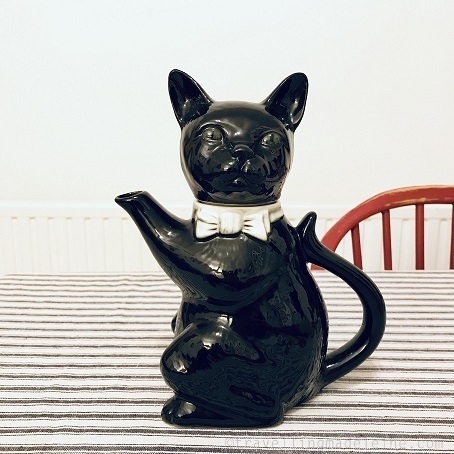 Popular cat teapot came back. Finally, my favourite swallow box. This is bigger than the stamp box I have before. It should be very useful. I will be at Old Spitalfields Market on 24th January. If not, I will be at Portobello Green Market on 25th January. From next month, I will be selling at Portobello Green Market on Friday every month. and at Old Spitalfields on the 3rd Thursday. But it depends on other events like big antique markets and London Fashion Week. In fact, I will be at Portobello Green on 15th February because of LFW. but I am sure that I can be at Portobello Green every time. However, Portobello Green is outside market, so I have to cancel if it is bad weather, like very windy or rainy. Portobello Green is fashion market and I will get a whole table, so I will bring loads of vintage jewellery there! 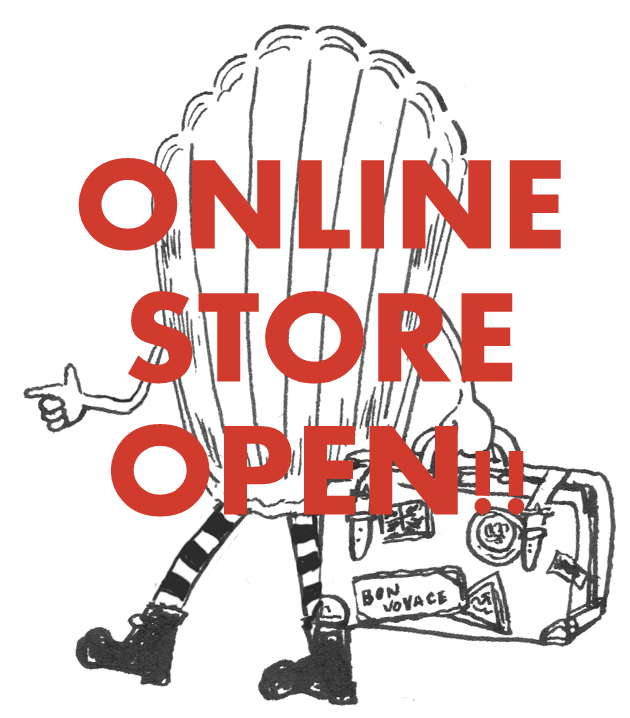 And, 2nd February is the 1 year anniversary of our online store! Yay!! I am preparing something special for you!! Furthermore, I have more special things for the following people! If you want this special things, please follow Instagram or online store and look forward to it! Maybe it's still 2018 January? Actually, I wrote almost the same thing like this in the first post of 2018. Because, I opened my online store in February 2018! It was really hard to get used to work for online store. I'm not used to it yet, and I still need to work harder. Time flies, but my step is so slow. I always think that I didn't achieve anything, but I did some last year. Took part in the event in Japan. And finally I made a life habit to washing my face before going to bed. Each of them are tiny things for other people, but it was a big step for me, which I couldn't do for many years. I think I take time this year as usual, but will achieve something one by one. Yes, I say that every year, you know, but please watch over me with patience. This is the best 9 of my Instagram in 2018.
and the 2nd best was my 40 years old birthday. Thank you very much for the messages and Like. I am in the 40's, but happy! Yay! 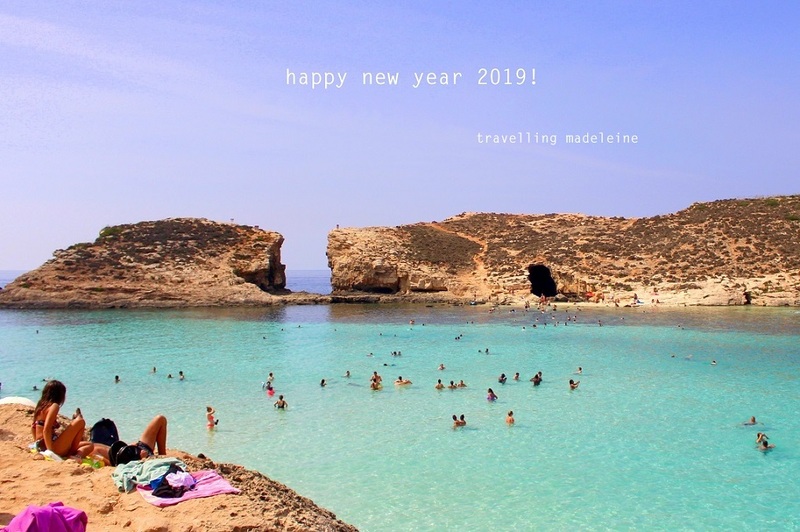 And, the amazing trip to Malta. We really enjoyed it, but the trip was good for our health as well. We live in Forever-Cloudy-Cursed UK, so we have an Calcium deficiency, but our nails are much better now. Plus, my mister is at the risk of becoming osteoporosis, but his bone density got better last year! It was the first time in several years. Sunshine is so important. So we decided to go to somewhere sunny for holiday every year. I hope we can go somewhere this year. 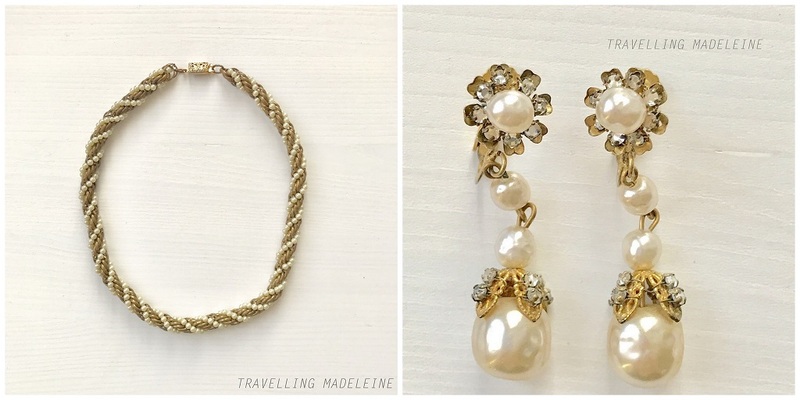 And my target is that I get my jewellery photo in the best 9 of 2019! !